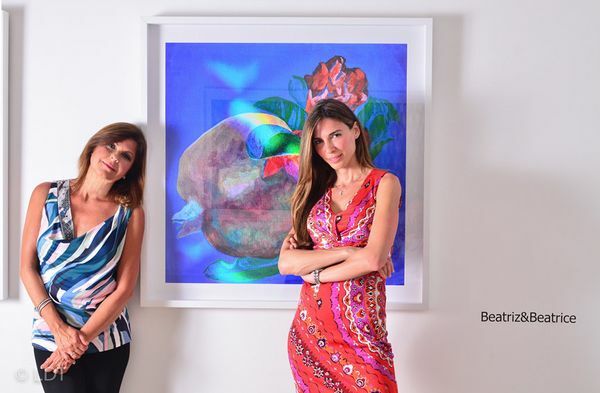 This statement is made by two artists: Beatrice, a painter and Beatriz, a photographer. Our oeuvre, nonetheless, is one. This tension between the individual and the dual drives our work in a pendulum motion between figuration and abstraction, between its painterly and its photographic qualities. Every painted image has a unique physical and oneiric energy which the camera lens reveals. The texture of the pigments on the canvas, like an alchemist’s substance, will seize the light and with it, the passing of time. Each reflection will alter the original image releasing its ‘hidden life’, its masks and its illusions. In close interaction, we select the most openly intriguing of these. It is then for the viewer to add her or his own layers of meaning. Themes come and go, some have faces, others surfaces. We have so far developed eight series which tackle with contemporary sensitivity classical subjects such as portraits and still lives. Three of them are related to women. They are Acqua, Opera Heroines and Per Sempre Due. In Ideal World we explore the universe of games and fiction. The Golden Branch, Generous Land, Ancient Civilizations and Flowers draw from the intricacies of colors, shapes and textures found in nature and architecture. All eight series belong in what we have called Time Lapses of Light. In this exhibition we have included three photographs from the series Acqua and Opera Heroines, and ten from the series The Golden Branch and Generous Land. The fruit theme has not been shown before. What drew us to it? We believe the attraction lay in the symbolic peacefulness of round or gently curved volumes. We also loved them for their carnal quality. In our works, no piercing angles disturb the fullness of their shapes, so that the color in them shimmers unhindered. To stress this effect, like the Spanish Sánchez Cotán in his suspended vegetables paintings, we have eliminated all other visual supports. Our berries, oranges, plums and pomegranates are passers-by or fully inhabit the picture space. There, they quietly but forcefully deliver their message of bounty. The photography will speed them along their journey, or will fix them in patterns, often pitting painted colours against prismatic ones. Once the photographs are in their glass cases, they will release further reflections and meanings: past and present involving artists and viewers alike.